Too often the half bath feels like the corner of the living room - who wants to use that? 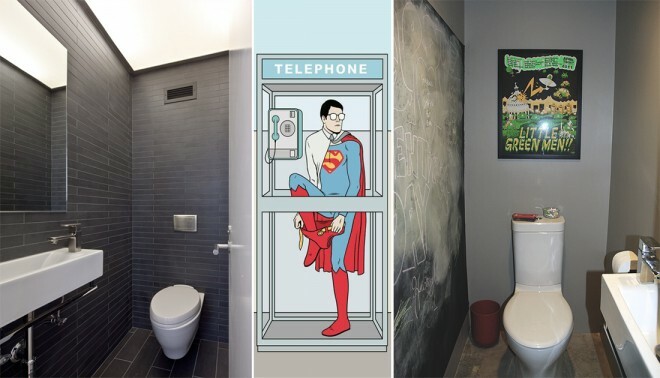 Here are four simple ways to set it apart - let guests feel like they're stepping into Superman's transformation phone booth! 1. MIND THE DOOR Doors (preferably solid core) should open into hallways, not right onto major rooms. No one wants to walk right out of a bathroom and stop the party. 2. MAKE IT FEEL REMOVED No guest wants to feel like they're still in the living room when they step into a half bath. Make the decor and paint color inside the half bath different from the rest of the house. This gives a greater feeling of being removed from the room on the other side of the door. Let guests step into Superman's transformation phone booth! 3. ADD SOMETHING UNIQUE Consider chalkboard paint on one wall, a whole wall mirror, tile all walls like an upscale spa, or other unique textures to set the room apart. 4. CONSIDER LIGHTING Changing the lighting is a great way to change the experience of a space. The light brightness level and fixture itself can help set the space apart - like the entire ceiling being a light in the above left image.